Here’s a quick, clear summary of Richard Bolles’ cautions about making a career change at 40 – starting with the foundation of a successful career change. 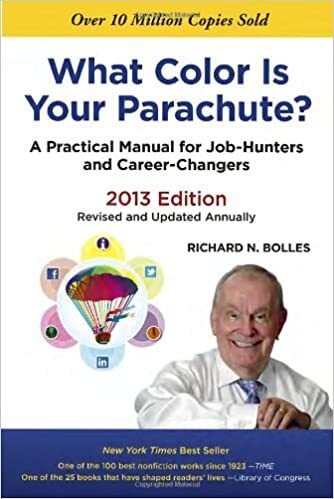 “Hope depends upon taking care that we have at least two alternatives in every situation, with every task confronting us,” writes Bolles in What Color Is Your Parachute? A Practical Manual for Job-Hunters and Career-Changers. When you’re changing your career at 40 or any age, hold on to the hope and faith that everything will be all right. You have options and choices, and you can move in any direction you want. Believe your new career will suit you perfectly, you won’t have any regrets, and you are moving in the right direction. Trust and believe in yourself. It may sound hokey and “woo woo”, but it’s the foundation of making a successful career change at 40 or any age. Bolles encourages career changers to start moving in the direction of their new careers by starting up a blog or website devoted to your new job. For instance, if you’re currently a nurse and you want to be a heart surgeon, start blogging about heart surgery. This may help your med school applications, give you additional information about the industry, and add to your credibility. If you’re not sure what career change you’re up for at age 40, read How Do You Choose a Career? 1. Change only one thing at a time. If you’re changing your career, try to avoid other major life changes as well. Keep your home life, social life, relationships, and health as steady as possible right now. “You need a place to stand, when you move your life around, and that place is provided by the things that stay constant about you: your character, your relationships, your faith, your values, your transferable skills,” writes Bollees. 2. Start with you, not the job market. Avoid taking the media or industry’s advice on the “hottest new careers” or “best places to find a job.” Instead, figure out what you want. This will help you find long-term job satisfaction and help you decide on a meaningful career change at 40. 3. Free yourself from old patterns. Look around for any type of career that interests you. Often, we fall back into the patterns we’ve been living all our lives. Instead of plodding along in the same career direction, talk to people who are working in fields or jobs that intrigue you. Why stay in the same job market when you’re changing careers at 40 – why not push the edges a little? 5. Expect to make mistakes. If you open yourself up to the expectation that you will take a wrong turn on your career path here and there, you’ll be more likely to take healthy risks. You have time to correct and recover from a bad decision – and the only way to know it’s a bad career choice is if you try it. Take a risk, and learn to be okay with making mistakes. (This is a good life tip, not just a caution about career change at 40!). 6. Have fun making this change! Sure, changing your career in midlife can be scary…but it’s also a very exciting time in your life. This is your chance to create a new life, start fresh, and use your brain and body in a whole new way. Bolles says if you’re not having fun changing your career, you’re not doing it right. Lightening up and having fun will also help reduce stress when you’re changing career at 40. 7. Remember there are no guarantees. “Don’t get a college degree in some career field just because you think it will guarantee you a job! It will not,” writes Bolles. This ties into the second tip about career change at 40, which is to use your interests and passions as the foundation of your decision. Don’t rely on the industry, job market, or even college recruitment posters to help you decide what career to choose. 8. Expect to be stressed about changing careers at 40. I think these tips for a career change at 40 can be applied to a career change at any age – or even when you’re 16 and trying to decide what you want to do with your life. In some ways, making a career change when you’re over 40 isn’t any different than switching jobs when you’re 20 or 30. Except, you may feel the pressure of age – and old age. You may be a bit more stressed at 40 because you have mortgage payments, student loan debt, kids’ expenses, car payments, etc. It feels scary to take a job risk or make a career transition at age forty, but it may be the best thing you could do at this point in your life. Here’s my favorite quote from What Colour is Your Parachute? “One of the saddest lines in the world is, ‘Oh come now – be realistic.’ The best parts of this world were not fashioned by those who were realistic. They were fashioned by those who dared to look hard at their wishes and gave them horses to ride.” – Richard Bolles. Another excellent resource for changing careers at 40 is The 4-Hour Workweek: Escape 9-5, Live Anywhere, and Join the New Rich by Tim Ferriss. Have a niche. You are definitely going to have a lot of choices when you change your career, but choice is really not helpful in the sense that you’ve got to get clear and very specific about what you want to do. When you go to market you want to be “one of one”. In other words, be specific in identifying a niche for your career so there’s no competition from other, more general job candidates. Get help with your career change. Think about what help you’re going to need when you’re making a career change at 40, and where that help is going to come from. Some of it will be close to you – obvious and free. Some of the help you need might not be so obvious and you might need to buy into it. For instance, you may need to become a member of a career development club to make use of its tools, support and community. Or, maybe you need to hire a job coach or employment counsellor to help you navigate the stress and fear that comes with changing a career when you’re 40 plus. These last two tips on changing your career are from 10 Ways to Get Focused on Your Career Change, on the Position Ignition website. What do you think about changing careers at 40 – or any age? If you having trouble with it, read Starting Over at 50 When You Feel Scared and Lost. What Does a Freelance Photographer Do?